the Tournament from Skeeter boats. The Tournament will begin Saturday Morning at 6am, weigh in will be at 2pm. Invocation will be conducted by Pastor Reese Watson, followed by the national anthem and blastoff. 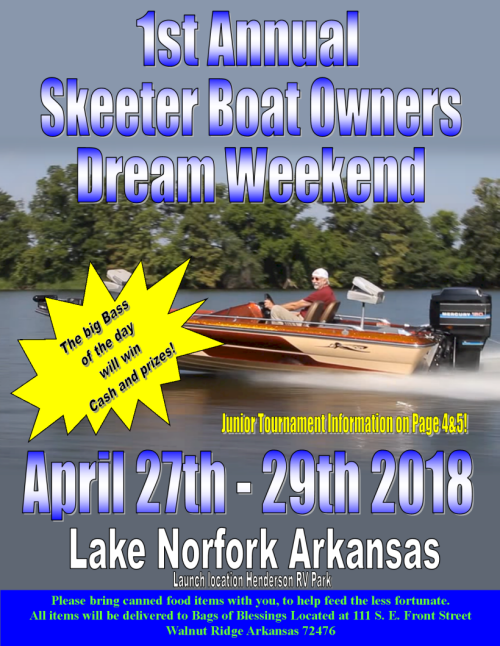 We will hold our Older Skeeter Boat Contest. Boaters will be launching from the Henderson RV Park Ramps. The ramp is in view of the Lake Norfork Inn.